Small farms and large agricultural companies will purchase a range of liquid agrochemical products from manufacturers to help increase crop yield. Pesticides, herbicides, insecticides, algaecides and many other chemicals can help control pests, insects, algae, and other animals and plants that devastate crops in the field. Other agrochemicals, such as fertilizers and soil conditioners, assist with plant growth. These chemicals can be extremely hazardous if directly touched or inhaled. An agrochemical filling machine is a vital solution for a manufacturer that is producing and packaging these chemicals at varying liquid volumes and product inventory quantities. PACK’R provides a range of filling and capping machines to agrochemical manufacturers based on the type of liquid chemical that is produced and the liquid’s characteristics. We provide turn-key solutions for smaller manufacturers that may have bottles, pails or jerrycans that require filling capacities of 100ml in shorter production runs, or for larger plant factories using intermediate bulk containers (IBC) and drums that have 1,000L liquid capacities. In addition, our team of engineers and technicians are available to help you with the design and manufacturing of specialized filling and capping equipment. We can provide you with a pesticide filling machine that is a standalone equipment system, or an inorganic fertilizer filling machine that will run in tandem with other existing equipment. An agrochemical filling machine from PACK’R placed into your processes helps to streamline production runs while eliminating filling mistakes and lowering the potential of workplace accidents. Our equipment offers increased accuracy rates to reduce the amount of product waste when filling by weight. Containers are filled to specifications, so you aren’t needlessly giving away extra liquid products due to overfilling. In addition, agrochemical liquid filling machine changeovers are efficient as we provide quick tooling solutions and a simplified machine interface when you plan on switching to different containers or products. With our liquid and capping machines, you can maintain productivity levels without dealing with any changeover errors that could result in lost product, unwanted downtimes or dangerous agrochemical spills. Whether you are in need of a semiautomatic pesticide filling machine or an automatic fertilizer agrochemical filling machine, PACK’R has you covered with cost-effective machine solutions. Let us supply you with turn-key equipment so you have the filling machine up and running the moment it arrives at the facility floor, or we can help you design a customized liquid filling machine with more specialized components and assemblies. 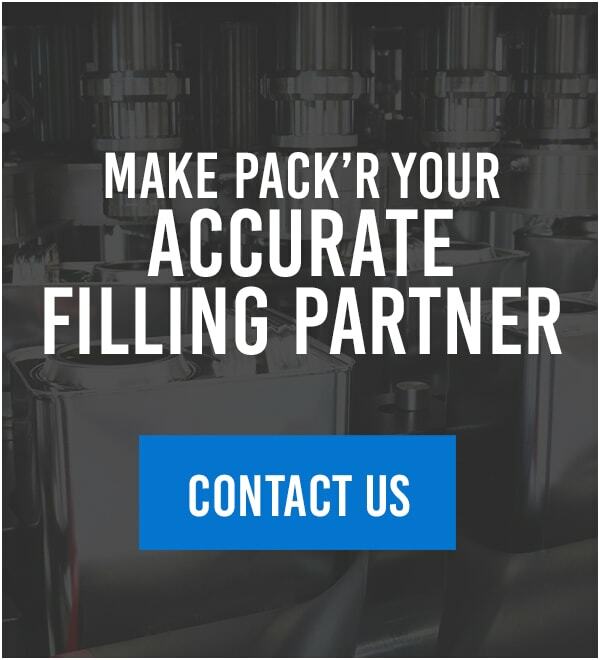 We are also here for you when it comes time for the maintenance and upgrade of your filling machines to ensure that your equipment stands up to the daily wear and tear of your production processes. Contact PACK’R today for more information regarding our agrochemical liquid filling machine solutions.